We will focus on POS tagging in this blog. While HMM gives us a joint probability on tags and words: . Tags t and words w are one-to-one mapping, so in the series, they share the same length. 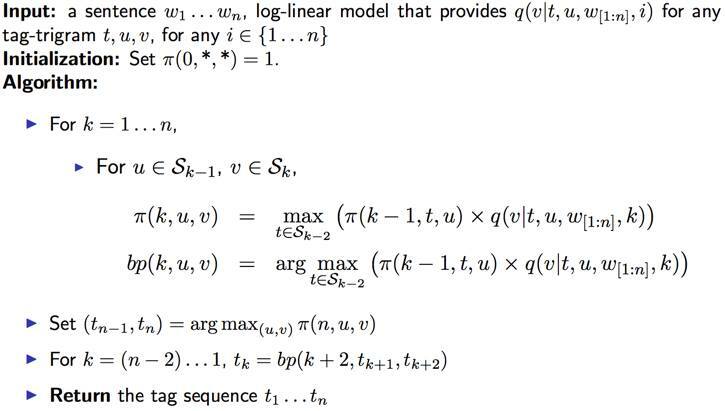 We will need an log-linear model to define , which means given the current sentence, what is the possible sequence of the tags for each word. The first line is simply a chain rule, which conditions on word from the start to the current, and tags from the start to the previous one. The second line applies the independence assumptions, because it is a trigram model, so we condition on only previous two tags, not every tag in the history. We will define a 4-tuple representation as the history: . Given the current position i, the first two elements are the previous two tags, the third one w is the whole sentence. Besides, we have a large set of all possible histories. Because you will have a number of different sentence length n, although the tag set is finite. A feature here, means a mapping function f, who maps input domain ( ) and tags ( ) to a real value. For example, a binary feature is defined as f: . We usually have more than one features, so we have a vector with m dimensions if we have m features. There is a trigram feature, and it is very similar to the trigram model. Another one is a tag feature, it is actually mapping a word to a tag. It is from language model. Say we have a labeled sentence: Characteristics \O of \O lipase \I-GENE.., we have now . At the position of i = 3, that is the word “lipase”, we will have both two features to be 1. Besides, we will have a weight vector , who decides which feature weights more. is defined as a set of all possible output structures given a sentence x. is a sequence of tagging . The data is described in this blog. Full data and code find here. We are using the same dataset on tagging these words. My code is missing the q function, thus the ViterbiGLM is only pseudo code. But you will find the codes for getting bigram and tag features. The vector can be computed using a perceptron algorithm, it is a way for parameter estimation. Here we read directly from the tag.model file, part of data is shown below.